Need help? Are your staff at risk during an emergency evacuation? While emergency evacuation procedures should be regularly practised; in the event of a fire, it can be easy for the instructions to be forgotten. A lift may normally be the quickest way to leave the building, but in an emergency, this can be dangerous. Remind both employees and visitors on your premises to avoid using the lifts in an emergency by displaying lift safety signs. We have a wide range of lift fire signs that are suitable for a variety of locations. To securely fix these signs, take a look at our sign fixings for a selection of hooks, adhesives and screws. During a fire or other emergency evacuation procedure, a lift can become a dangerous place. If the electrics fail anyone in the lift can become trapped, possibly between floors, with no way of escape. Attach lift safety signs at all lift entrances to remind everyone of this so that even during an emergency, everyone knows to find an alternative way of safely exiting the premises. For employees and visitors with disabilities, using a lift may be the only way that they are able to independently leave the building. To keep everyone with disabilities safe, ensure that you have refuge points where they can safely wait for assistance, and advertise these clearly using our refuge point signs. Alternatively make sure that you have a transit chair on site to assist with transporting those employees and visitors with mobility problems down the stairs. These chairs should be easily identifiable and placed within easy reach. Most are designed to fold flat and be secured to a wall; the location of these too should be clearly indicated through the use of a transit chair sign. Our lift safety signs are available in a variety of materials to suit most business premises. 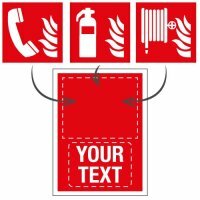 All feature the easily recognisable crossed circle with a fire pictogram, and they have eye-catching writing that is easy to read, even in an emergency situation. Some also include a reminder to use the stairs. To ensure that your lift safety sign is easily seen in the dark or when a room may have filled up with smoke, then photoluminescent lift signs should be used. These will glow in the dark for up to six hours once activated by a good light source. Ensuring that everyone does not use a lift in the event of an emergency is just one of the lifesaving instructions that all workers and visitors will need to follow. For an efficient emergency evacuation procedure, use our lift safety signs in conjunction with fire assembly point signs and fire door signs to make sure that everyone knows where to go and what to do in an emergency. Additionally, display fire action notices to provide information on your company’s full evacuation procedure. 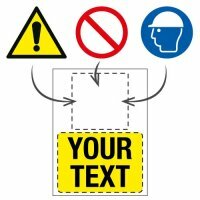 Our comprehensive range of lift safety signs should suit most workplaces, but as all premises are different, you may have some special requirements. If you cannot find exactly what you need in our current range, then we can create a sign that is unique to you and your business. The safety of employees and visitors is always a top priority for businesses today. While it is hoped that an emergency evacuation will never be necessary, it is essential that you are prepared for any eventuality. Lift safety signs are a key part of your fire safety procedure. With our lift signs prominently displayed at all lift entrances, you can be reassured that in the event of a fire, everyone knows to avoid the lift and find another, safer way to escape the building.